A man caught drinking and driving had two children in the car when police stopped him on suspicion of speeding. Officers pulled the Vauxhall Zafira over in Nacton Road, Ipswich, after it was caught doing 44mph in a 30mph zone. Children aged 12 and 10 were in the car when it was stopped at 20:45 GMT on Sunday, police said. The man is due to appear at South East Suffolk Magistrates' Court on 25 March, charged with speeding and drink-driving. 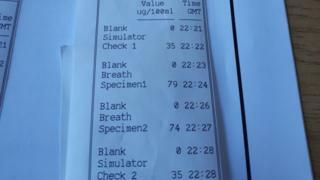 A breathalyser showed the driver had 74 micrograms of alcohol in 100ml of breath when stopped. The limit is 35 micrograms. Norfolk and Suffolk's Roads and Armed Policing Team tweeted a photograph of the man's results. They wrote: "Shockingly two children were in the vehicle when stopped and another child left home alone."